This salad is always a favorite at our Easter dinner table. 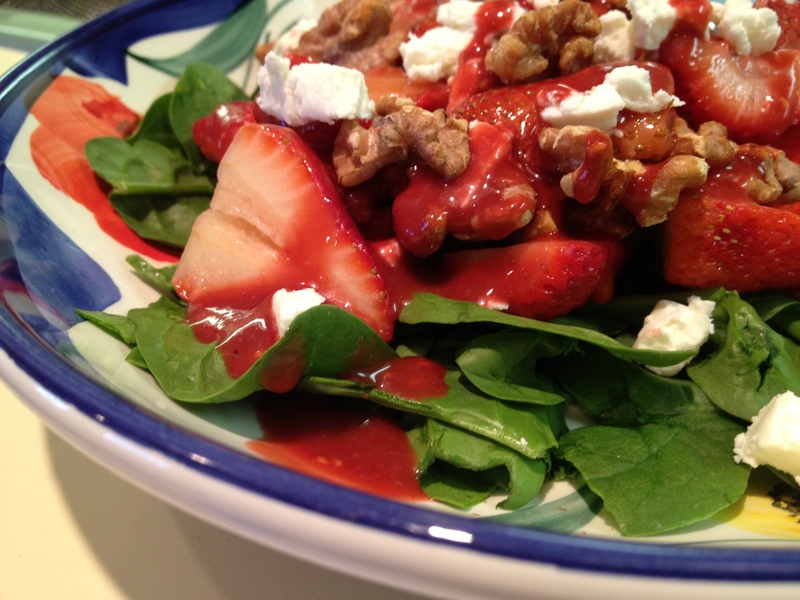 The strawberries are so fresh, and the assembled salad just shouts Spring! Try adding grilled chicken for a complete meal. Arrange spinach on 4 salad plates or bowls. Disperse the strawberries, red onion and feta among the four plates. Chill until ready to eat. Sprinkle on nuts before serving. Preheat your oven to 425 F°. Line a small baking sheet with parchment or foil, with edges folded up to retain juices from strawberries. Remove all leaves and stems from strawberries. Place in the oven and roast for 15 to 20 minutes, or until caramelized. Remove strawberries from oven, allowing to cool down for 5-10 minutes. Add to blender (ninja, bullet or immersion blender) with all other ingredients, making sure to capture all the strawberry juices from the pan. Blend until smooth. If you like your dressing a bit thinner, add additional olive oil until it is the consistency you desire. Refrigerate and serve cold over the spinach salad. Add grilled chicken for a complete dinner!